In this year’s e-magazines, the Executive Director would like to share the thinking behind our activities: why do we do what we do, how do we accomplish them, and how do we overcome our challenges in the rapidly changing environment. We would be delighted to hear what you think with your comments and responses, even if it is constructive criticism, sent to the email address at the end of the article. In 1999 Professor Nicole Coolidge Rousmaniere laid the foundations of the Sainsbury Institute and started to build it up with support from Dame Elizabeth Esteve-Coll and Professor Kawai Masatomo, both members of our Management Board. At the outset we were a rather odd existence in Norwich, single-handedly dealing with all matters relating to Japan. Perhaps the environment in Norwich was a bit dire at the beginning. Anti-Japanese feelings ran high as a result of the tragic fate of the members of the Royal Norfolk Regiment, who were POWs of the Japanese military during the Second World War. 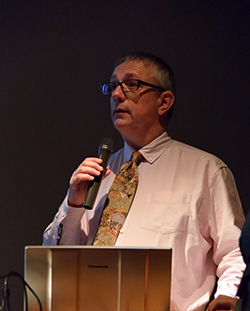 Thanks to the sound advice given by members of the local community, including the then Bishop of the Norwich Cathedral, the Institute became a part of the reconciliation process by running a monthly lecture series on the third Thursday of the month relating to topics concerning Japanese art and culture. I am pleased to say that these lectures have now become firmly rooted in the cultural scene of the city. 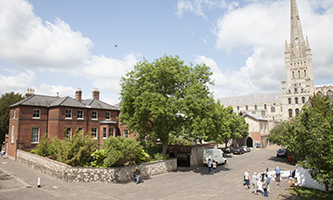 Although the Institute was created as a part of the University of East Anglia, it needed strong academic support from other UK organizations related to Japanese art to jump-start its activities. Our strongest allies in this endeavor were the British Museum and the School of Oriental and African Studies, University of London (SOAS). Both institutes have a long track record of being centres of excellence in researching and teaching about Japan in the UK. Major exhibitions involving our academics such as ‘Crafting Beauty’ and the ‘Power of Dogu’ were successfully carried out at the British Museum. The Institute was established in 1999. It has been at its current 64 The Close address, right in the heart of the historic city centre of Norwich, since 2001. Our London Office was established within the walls of SOAS, and the Head was appointed from their academics. The Institute’s flagship program, the Robert and Lisa Sainsbury Fellowship, was operated from the London Office and our fellows benefitted largely from being part of the SOAS academic environment. Without these close relationships and the support we continue to receive from the British Museum and SOAS to this day, the Institute could not have achieved the goals that it has. Fifteen years onwards, partly due to the success of the Institute’s activities, and in part because of the attraction that Japan has in particular amongst the younger generations of the UK and Europe, Japan has now become an important part of academic activities at the University of East Anglia. 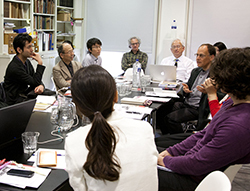 In May 2011, the Centre for Japanese Studies was established and the following year a BA course in Japanese Language Studies was launched. 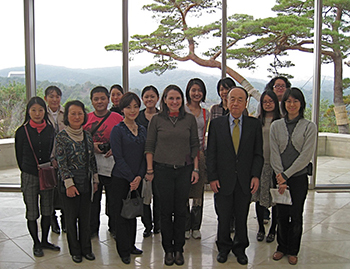 The number of lecturers teaching modules related to Japan has increased dramatically in the past five years. The Fellows are now based in Norwich. Our Sainsbury Fellows are now all based in Norwich and in addition to presenting lectures to our Third Thursday audience, they also participate in academic activities organized by their counterparts at UEA. 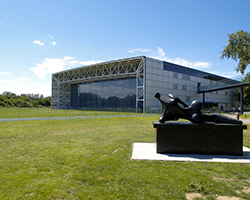 Moreover, the Institute itself is now a member of the Sainsbury Institute for Art (SIfA), with the Sainsbury Centre for Visual Arts (SCVA), the Sainsbury Research Unit for the Arts of Africa, Oceania and the Americas (SRU), the Faculty of Art History and World Art Studies at UEA (ART), and the South Asian Decorative Arts and Crafts Collections (SADACC). Stronger synergy with the other beneficiaries of the Sainsburys’ legacy is fostered at the institutional level with the creation of SIfA, which aims to offer a unique range of perspective. These organizations are also at the forefront of research, teaching and public engagement in the world of art history. At the same time, at the individual level, interaction between our academic staff and fellows with members of SIfA continues to grow. As a decisive move to further our integration with SIfA, UEA, in 2019 the Institute will move its headquarters into the University campus. While maintaining the footprint that we have managed to establish in the city, preparation towards this move is already underway. One of the unique features of the Institute is our resolve to promote research and outreach activities, putting equal emphasis on both. This is what sets us apart from faculties of Japanese studies at universities. At the same time, fostering the learning by future generations has always been a preoccupation for us. The Robert and Lisa Sainsbury Fellowship has been instrumental in supporting young academics by providing financial support and time to post-doctoral researchers in the discipline of Japanese arts and cultures, during which they can further their research and complete their manuscripts which are essential for securing a tenure track job. Many former fellows are now teaching at universities in the UK, Japan and the United States. This is testament to the success of our program. We have gradually widened the scope of our educational activities. With the creation of the Centre for Japanese Studies, led by Dr Simon Kaner, who is also the Head of the Archaeology and Heritage Centre of the Institute, we have started to cooperate actively with UEA at the undergraduate level. Last year a Summer School course in Japanese studies named ‘Japan Orientation’ supported by the Toshiba International Foundation was offered. Twelve students who participated from Poland, Hungary, Czech and Slovakia received full scholarship celebrating the 10th anniversary of the accession of the so called Visegrad Four countries to EU. Student exchange is another area we would like to promote. There is fascination among the younger generation in the UK and Europe with Japan, and at the same time undergraduate students in Japan are eager to study in the UK to polish their English, while immersing themselves in British culture. The Institute has recently signed an agreement with the University of Tokyo, which is without a doubt the best university in Japan, for student exchanges in the area of archaeology and heritage studies. This program will start this summer and will run for several years. In March, we will welcome a large group of students from Nara University, another university with which the Institute has concluded an agreement for academic collaboration. There is no better way to promote cultural exchange than to let people actually visit a foreign country and immerse themselves in the culture. The Institute is committed to furthering exchanges at all levels, and in particular for the younger generations.